In part three of this tutorial series, we stopped at creating the cart provider. Lets start by creating the cart page. By the time we finished the cart page, the result will look like what we have below. Let's start by adding all the required imports. 1. cartItems of type array which will hold the items that are added to cart. 2. totalAmount: of type number which holds the total amount of products in cart. 3. isCartItemLoaded of type boolean which will help detect if cart items has been loaded. The loadCartItems method will be responsible for loading items in cart as the name suggested. The function is pretty simple, we are just making a call to the getCartItems in the CartProvider service, and then sends the returned array of items to the cartItems variable so that we can use it in our cart.html page. It then also check if the returned array has record or not, if there are items in the array we move on to calculate the total amount by looping through the items then set the isEmptyCart variable to false. There is also need for buyers to be able to remove item from cart so lets make another method to handle that. The method just call the removeFromCart method in our CartProvider service. The last method in the .ts file is the checkoout. This will be called when the checkout button is clicked. In this method, we took advantage of firebase auth to check if the current user is logged in or not. If logged in it sends user to checkout page if not the user is sent to login page. As always let's start by necessary imports for the checkout page. Open up the OrderProvider and let's add some codes. This method accept order object that will be sent from the checkout page. As you can see, it took care of order and order details. The order object has Order Ref, Custmer Name, Shipping, and Amount while the order details object contains the Order Ref, Product Name, Count and the total amount. There is just one private method that generated order ref. Now that we have created the two providers needed in our checkout page let's now check out the code in the .ts file. Our second task is to display the order information on the page. To achieve this, we will be calling two methods from our providers - getCartItems from cartProvider and getUserDetails from AuthProvider. Some more functionalities can be added to this application. 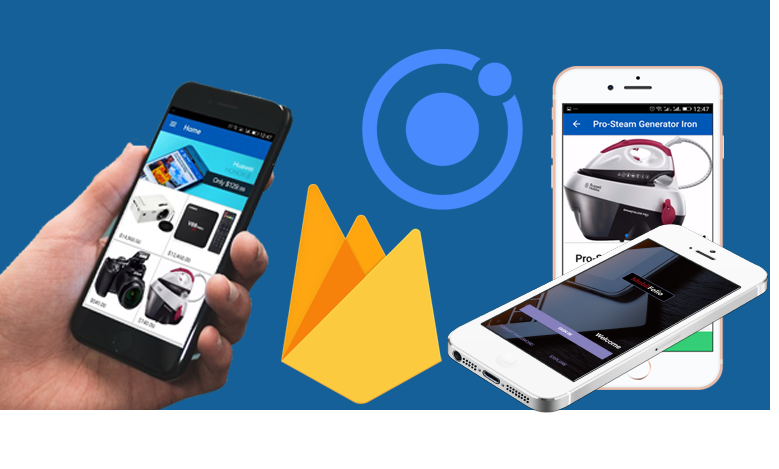 But am going to stop here and hopefully this article has helped a lot of people to get started building an ecommerce app using ionicframework.